So, Rosmah didn't buy no pearls. And Najib's daughter was not in Perth at all! was told the consul general in perth sent a letter yesterday evening to the editor of the west ausralian, the newspaper that wrongly reported about najib's daughter's spending spree here. Wlll try and get letter later. Boarding flight home now. For PM, you sure take an extra mile defending him. If you are right about PM's daughter whereabouts, I support your actions. How about doing this for an innocent 16 year boy? Rajinnya Rocky....letter alone is not enough, must make police report barulah ngam !! Woi Rocky, balik nanti tolong kasi tulis cerita lembu shahrizat, boleh ?? itu menteri sudah banyak kuat main lembu sama rakyat !! Where has all the fire gone? And what's now in your belly? Only those that make you prosper. Tok Rocky Brew, ini cerita pencuri ayam di kampung saya. Dia cukup famous. Bila ada ayam kena curi, orang tuduh dia. Walaupun yang curi orang lain atau musang. Polis gerenti cari dan tangkap dia. Dia pun dak muah kena cari polis jadi bila ada berita ayam kena curi dia serah diri kepada polis. Dia keluar masuk lokap tapi tak pernah masuk penjara sebab tak pernah cukup bukti. Tapi yang bahaya Tok Rocky, ialah musang berbulu ayam, serigala berbulu biri-biri. Macam mana nak defend mereka Tok. Silap-silap serigala ngap Datuk. Jaga-jaga Tok, dalam kumpolan serigala, betina jadi ketua Tok. If it is not Najib's daughter, don't tell me it was one of his many GFs? Regardless, Malaysia still hurtling towards bankruptcy......alamak! I'm fine with the daughter's thingy, maybe she wasn't there afterall. Tak jalan-jalan, ronda-ronda kat rumah Pak Lah? Tulah tak nak baik dengan dia, kalau tak boleh jadi house guest dia. Wahai orang orang yang bodoh apabila kamu telah berjaya dibodohkan maka hendaklah kamu sentiasa menjadi bodoh kerana kebodohan kamu itu adalah tanda bahawa kamu telah betul betul bodoh. Jika kamu bertemu dengan ayat ayat semiotik ini maka hendaknya pecah kebodohan kamu itu agar kamu menjadi insan yang bertakwa – ayat T ~ T.
what about to australia goverment. they should apologize as a host and give a warning to the paper for missused the liberty of information. where is the human rights or freedom of paper right in this??? 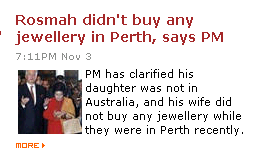 the story in the west australian did not - i repeat, did not - mention who the first lady who bought the pearls was. you'd know that if you had cared to read the story. lim guan eng's son, you mean? how to defend him when his own father seemed more interested in politicizing the who "raba" issue rather than nipping it in the bust. Er, I mean, in the bud. persetan lah dengan komen sekutu pembangkang ni. depa tu hanya mau hang sokong the Lim's, Anwar's, Karpal's and Nik Aziz's suku sakat aje. the moment hang defend Najib terus tudoh hang tak ada principal! principal kepala hanggok depa. So it is a draw. State Chief vs Federal Chief came to an even conclusion. But on the moral issue, the Federal Chief should receive the accolades for not criticizing gutter slanders, unlike the State Chief who resorted to overly defensive retorts. The main winner in these games? None other than Mis - Chief. Maybe clarifications as in Bolehland may not be enough. Maybe a proper investigation demanding that high end store release all of its security tapes unedited to kill off all speculations. Me think Dato and friends do have the talent and resources to do that. Yep LGE keeping the issue alive to continue criticizing UMNO and gain sympathy from his fans. If not he will be the first to lodge a police report. Very funny for this man and father who are fond of suing people for little things. So who is using the boy for political mileage? Locky Blew aa, PM said aa, daugther not in Pert loo! whaa, you belly collect aa. But why aa PM no lespon to wife buying liamond flom New York aa? You know why aa? Can celita celita a bit aa? Tank kew aa. Cmon rocky, you're not that stupid, are ya? the newspaper who wrote something based on something even they didnt quite confirm about, what journalism school they went to? i mean writing something based on hearsay (because they wrote something like ... ' believed to be spending this amount that amount ' ) means the lacking level of basic journalism and not to mention they are the mainstream media! could it be someone from here trying to paint someone else black using someone else ink? hahahahaha...damn even the PM twitter is not enough for them..but if the "so called leader gifted from god" sent a twitter everything will be true..
claim fight for a better future, claim the current is corrupt, claim fight for righteous but all talk no action, when comes to action this set of rules for us, and this set of confirm bersalah rules for anyone that apposed us. Your reply to anon 5:36 is incredibly insensitive (bru@7.33) If I may ask, is the boy innocent? Did the bloggers who whacked the boy truthful or lying to get at his father. Oh! the way you put it (raba and busts and bud) ranks you as number one scum and nut. I pity you. Howdy mate, just back from ozieland eh. How are those legal immigrants formerly from malaysia doin' there? Guess they wud feel they are really minority there, wonder any vernacular school there and how about temples and shrines, are they mushrooming like those found in selangor for example. Hey, by the way, heard that no more free education for PR status immigrant eh, is that so? Wow, pangsai ma like this, aussie dollar also high and sing dollar also high ma. Better here ma, got vernacular schools some more najib gov gives subsidy ma. Wow now we chinkies got subsidy ma to build schools. Yo, about LGE raba thingy no sweat ma, papa LKS got Kapal to sing the tune and bankrupt those bloggers ma, like our idol down south ma, bankrupt those against them to death. Hiya, time to go pangsai ma!. Are you a political secretary of Najib's family? Heh, heh - anon 1:55 AM. Why get your knickers (or, in your case, is it seluar dalam?) in a twist about Malaysians who have migrated to Aussieland and who have secured PR status there? At least, they have the benefits of having their kids study in all-English language schools and then going on to uni, which are ranked much higher than their Malaysian tertiary education counterparts. Plus the Aussie government is encouraging schools to offer Mandarin as an elective, in addition to French, Spanish, Italian and, lately, Bahasa Indonesia. So, being fluently bilingual in Aussieland is not a problem, brudder. Some more, got real freedom of worship, lah. Can freely convert from one religion to another without threats or sanctions. Can hold gay and lesbian rights parades too! What's not to like, eh? Now, did you rack up enough "points" to qualify for migration to Aussieland? Maybe not, hence the angst! Letter: What will Ambiga have to say about this? Serious blunder or dishonest reporting? Ah, Ghani, what have you done? A new party again, Ku?